Roughly the size of two minibuses, the six-wheeled Toyota-JAXA lunar rover will be about 20 feet (6096 mm) long. 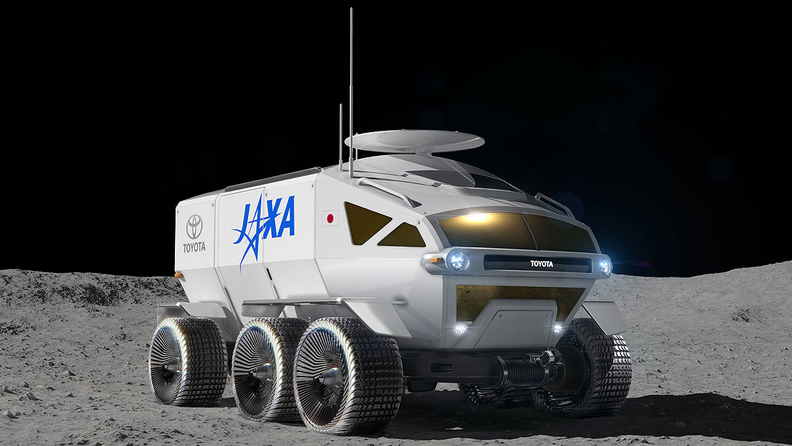 Toyota is scoping out a new frontier: lunar rovers. The Japan Aerospace Exploration Agency is teaming up with the automaker to build a six-wheeled self-driving transporter that can carry two humans for a distance of about 6,200 miles (10,000 km). They are aiming to land a vehicle on the moon in 2029. The announcement comes less than a week after Tesla co-founder Elon Musk’s SpaceX docked a craft at the International Space Station. Toyota’s fuel cell technology will power the rover, which will be big enough for two astronauts. They will be able to take their suits off and live in the vehicle as they explore the lunar surface, said Shigeki Terashi, an executive vice president at Toyota. “It’s an extremely challenging project, and we have high hopes for Toyota’s technology,” Koichi Wakata, an astronaut who has flown in NASA’s Space Shuttle and served as the first Japanese commander of the International Space Station, said at a JAXA event. Toyota has for years made robots that are designed to perform tasks such as housework, and to help people who have difficulty walking. Now it’s using its technology to conquer space. Roughly the size of two mini buses, the Toyota-JAXA lunar rover will be about 20 feet (6096 mm) long. The rover will use solar arrays and fuel cells to generate and store power. It will land on the moon before a human expedition arrives, and drive to meet them. The project calls for the rover to be used in four other exploration areas, so it will have to move around on its own to meet arriving astronauts. The announcement comes at a time when China is ramping up its own space ambitions, thanks to an annual budget of $8 billion -- second only to the U.S. Following a world-first landing on the far side of the moon in January, the world’s No. 2 economy is also making plans for a solar power station in space and a Mars probe is likely before the end of this decade.